Here, I highlight current and past work particularly relevant to my evolution as a professional. Check out my Master of Science in Information Management capstone project! Part of the graduation requirements for the Master of Science in Information Management program, the capstone experience calls upon candidates to integrate their learning from across the two years of the program to produce a final project that shows breadth and depth of learning. My project focuses on creating a metadata schema for describing environmental sustainability data at the University of Washington. It integrates user interviews, schema design and creation, usability testing, and research into a single project that aims to provide a basis for consolidating information about cross-campus sustainability efforts. Since this is an ongoing project, updates will post here regularly. My independent study this quarter is essentially a continuation of my Winter 2009 independent study work and focuses on publishing a series of papers generated throughout the last two quarters. My final project for this class involved making an XML schema for the IT department at the University of Washington's School of Nursing. This schema describes the relationships between people, grants, and projects within the School of Nursing and was intended to establish a foundation for further discussion about maintaining this information in a structured manner. My independent study this quarter focused on researching the intersection between information management and environmental sustainability. My colleague Al Youngblood has assembled an excellent page describing this project, which focused on creating an infrastructure for pushing information about research grants out to the student population at the University of Washington Information School. This project was done in close collaboration with the Information School's Research Services unit. I implemented a temporary time tracking system for employees of the School's IT department. As a WTA trail volunteer, I wanted to rework the volunteer signup process for work parties from end-to-end to make it a more complete and engaging experience. As the technology officer for the Association of Information Management Students (AIMS), I was responsible for the design of the initial version of the AIMS web site. 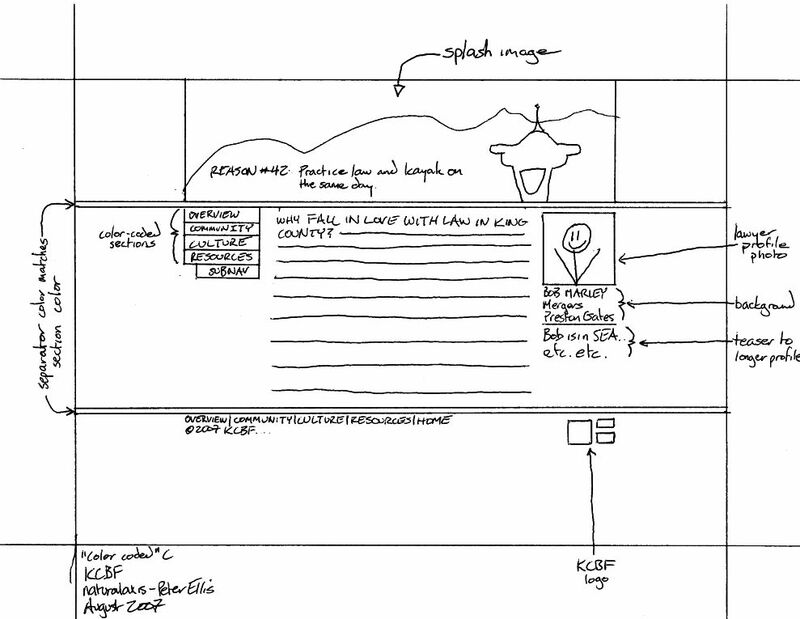 Originally, I created two wireframed possibilities for the overall layout in Visio. 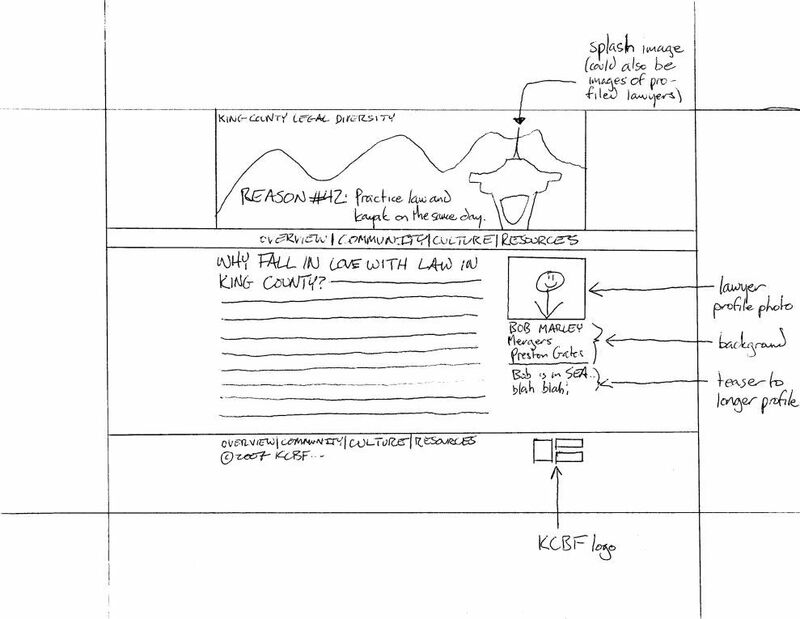 I did some pro bono work for the King County Bar Foundation doing a web site redesign (which was never made live). 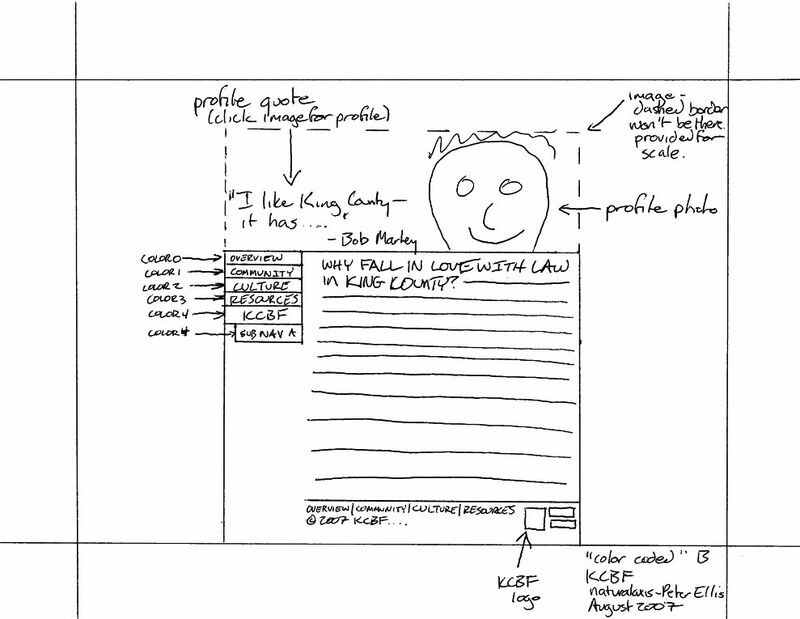 The following hand-drawn wireframes were potential layouts for the redesign; in the end, a combination of these was selected. Program Description: While collaborating to create our new web-based appointment system, Evergreen's Writing Center realized that our technology conversations had only just begun. Join a group discussion about how we progressed from addressing specific design questions about the system to a larger discussion of how technology assists our culture and mission. All viewpoints are welcome! Program Description: How do Writing Centers make web sites part of their core operational philosophy? This is a seminar-style session about the advantages and disadvantages of using web sites as a communication tool. Come network with other participants and collaborate on future web site work!